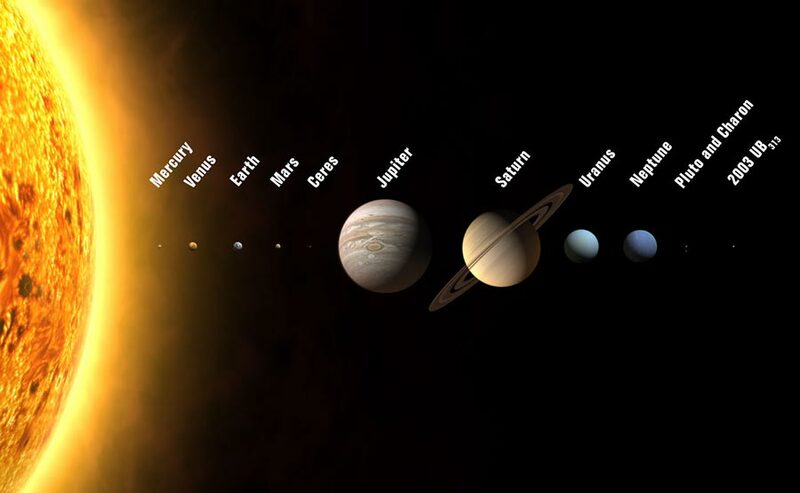 This is a picture with relative sizes of the planets in our solar system to the sun. Of course the distances aren’t to scale, but it does give you a sense of the immensity of where we live. And think about this… we are but a speck of lint on a speck of lint in the universe! If the distance from the earth to the sun were the thickness of 1 sheet of paper, then the distance from earth to Pluto would be 40 sheets of paper. The distance to Alpha Centauri, which is the closest star at 4.3 light years from earth, would be a stack of paper 71 feet high. The distance across the Milky Way (200,000 light years from earth) would be a stack of paper 620 miles high! And yet the Milky Way is just one MINOR galaxy of the billions of galaxies we can see! There is a video on The Molecular Expressions website of Florida State University that is awesome. If you CLICK HERE, you can take a video trip through the cosmos like you may not have seen before. This will give you a sense of how great, and meticulous, God is. He created everything from the vast expanse of the universe to the smallest elements that not even electron microscopes can detect. Slow down sometime today or tonight. Look around you at the creation you can and cannot see. Affirm in your heart and spirit what the Psalmist wrote. Worship God, for all around you there is evidence of His existence! Oh how great and awesome and powerful and majestic and wonderful our God is! Let every toungue praise Him! Let every nation bow down before Him! Let every knee bow in humble submission! May everything that has breath worship God as Master… Savior… Creator… Sustainer… and Giver of Life! There is no God but Jehovah God! Awesome! !What a great, awesome, Isaiah 40 God He is!!! So cool. I needed to be reminded of how awesome that He is. I have been worrying about finding a babysitter. I know the God who created “everything” and I do mean “everything” will send us someone. I could watch that video over and over. God is so incredibly awesome and I am such a speck…………and HE loves ME!!!!! You all are right, we serve an awesome God who is above and beyond us, yet He has chosen to love us. What a mighty God we serve! To see things GOD has done and will continue to do and yet HE always has time for me and is always there for me.That is what is awesome.